I have posted very few of my pen and ink drawings, so I dug deep to and found an old sketch book from nearly 30 years ago. Here are a couple of sunfish drawings for your consideration. 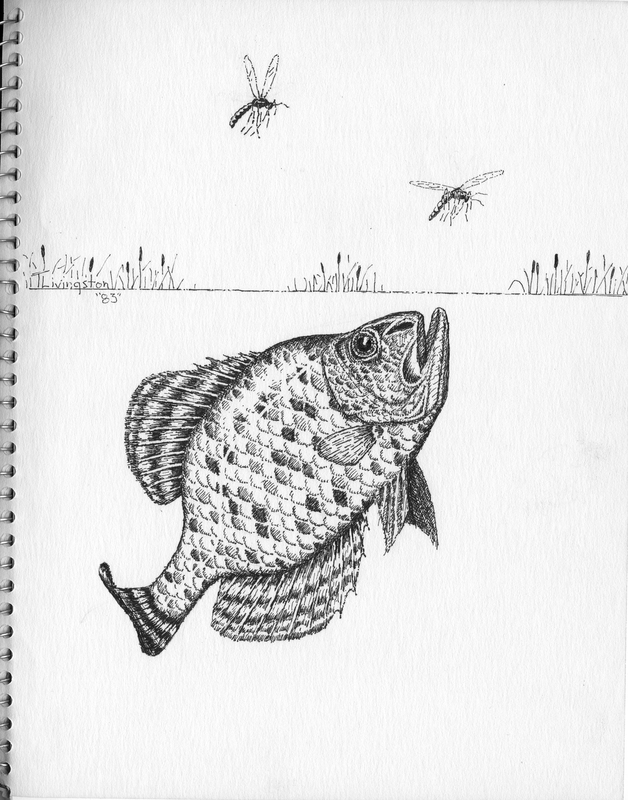 I drew these fish when I was in college. One of my roommates was a wildlife major. When I was half way through one of the fish I realized I made a HUGE mistake. I finished the picture anyway. Then I presented the picture to my roommate and asked if he could see anything wrong with it, but he thought it looked good. Then I told him there was definitely something wrong with it. He still couldn’t find anything wrong. I finally had to tell him what it was. Here is your challenge if you choose to accept it. What is wrong with the picture? I will give you one hint. The mistake is in Sunfish 2. A wildlife major couldn’t find it. Can you? 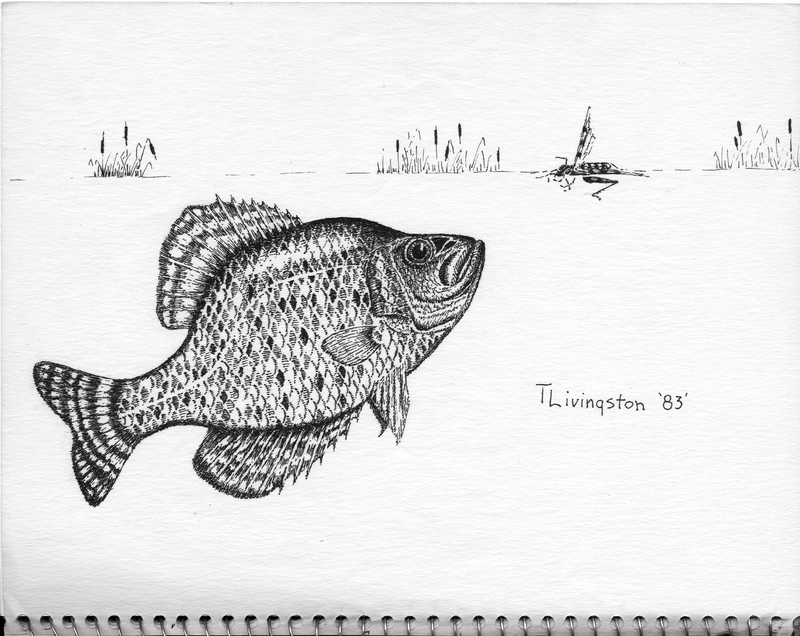 This entry was posted in Pen and Ink, Wildlife and tagged drawing, fish, mystery, pen and ink, sketch, sunfish by foresterartist. Bookmark the permalink. A sunfish wouldn’t be interested in a dead fly. Only a live one. Thank you for guessing. Our sunfish seem to bite everything freckles and actually it is a grasshopper floating on the surface of the water. The “mistake” isn’t related to behavior, try again. Thanks for the guess. It has to do with the anatomy of the fish. By the way, Sorry about your Dodgers. Ok, here’s my guess. There’s a different number of spines (for lack of a better word) protruding beyond the fins in the second pic, so perhaps that number is constant, like humans having five fingers and toes. That’s a good answer, but I can’t remember when I did the pictures if I drew a correct number of spines. You may be right on that point. However, the mistake wasn’t really that obscure. In fact it is kind of glaring once you know what it is, but the longer you stare at the fish the harder it is to see. I bet you do know. Somehow that wouldn’t surprise me. If anybody wants to tell me what the mistake was on the sly, they can go to my facebook page and click on the message bar! If I interpret your cryptic answer correctly then I think you got it…..maybe? i don’t use facebook, but yes, i am sure that there’s something a bit backwards somewhere, everywhere! Yes indeed! You are quite correct. Tomorrow I will post the answer the the Sunfish Mystery, so get you guesses in today. Boy the poor fish would be creating a whole lot of drag while swimming wouldn’t it!?! I don’t know, and I was a wildlife major – ha! Not a fisheries major, though. These illustrations are amazing!!!! Love them! Thank you. If you get a pass because you were a wildlife major, then maybe I should get a pass for drawing wrong because I was a forestry major. It must be the sawdust between the ears. I had no idea such fish exists:-). Sunfish… hmmm. How poetic! They only seem to exist in my repressed imagination. I really enjoy your blog. Your drawings are so beautifully detailed. I am new to blogging and I am just discovering what a wonderfully, enjoyable blogging world it is out there. Thanks for sharing your lovely work and for visiting my site! Thank you so much. Your watercolors are fantastic! I didn’t realize you were new at this, because your site is very nice. I’m pretty new at this myself. I’m glad you enjoyed my site. That wasn’t the huge mistake I made. It was much dumber than that. These fish have an ear flap on the back of their gills that I did not feature prominently on these illustrations. So it could be argued that it was a mistake and I would concede it, but if you wast the other answer go to my post One Of These Fish Is Not Like The Other. Tim, I could not tell you one fish from another, leave alone mistakes… maybe I could about the big and vicious ones.. Let me tell you it is another great drawing! Thank you. If you go to, One Of These Fish Is Not Like The Other, the truth will be revealed. Amazing! Very clean lines, i love it! Very nice drawings! As for the mistake… Maybe you draw one of them with the right (or left) side of your brain, because something in it looks kind of “reversed” 😉 And thanks for stopping by my blog! I had not thought of it that way. Perhaps you are right! Amazing you’re the only one to guess that. Spiral, or something like that. That was like playing Spot the Difference, only much more fun. You should do more of these ‘What’s wrong with the second picture?’ puzzles. You know how it is when you get all intense on a project. I was 2/3s through it when I realized the scales were going the wrong way. It is kind of funny, but I have had more fun with this piece over the years then if it had been correct. I don’t know about puzzles though. I might have to wait until I make another mistake, which might not be a very long wait!